It's a long list but all very reasonable expectations. We considered Muskoka chairs (too heavy to move around and most are too high maintenance). I don't do plastic woven furniture — I just don't. We searched through IKEA's offerings and they were falling short on a few of the key criteria. I considered Butterfly chairs (hard to get in and out of, might blow away) as well as Acapulco chairs (could have worked, but skinny legs might not have been dock-friendly). If I sourced either one of these as the chairs I would then need to find sun loungers with a similar look. That would be a tall order. 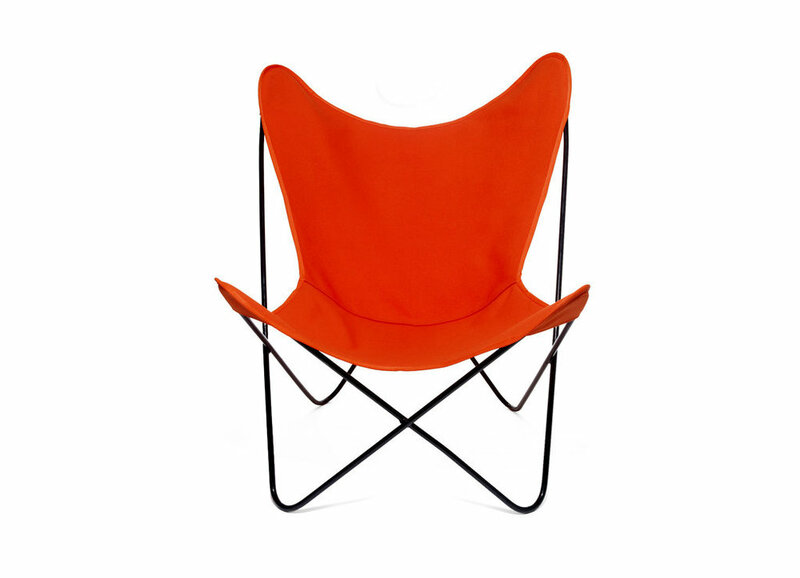 We considered these lovely sling chairs by Gallant & Jones. They are from Vancouver and come in so many fun fabrics. But alas, a bit too low slung. But then the aforementioned cardiologist (significant other of my client) spotted these in a copy of Garden & Gun mag he was perusing on a flight. He sent over the link and I FREAKED OUT. They existed exactly like this in my head given the criteria, but I could not find them available on the market. I popped onto the Sunrise Chair Co. site right away. ...AND they are available as a full sun lounger by simply hooking on a footrest attachment. So, not only do the sun loungers EXACTLY match the chairs, but if you are entertaining a crowd, just unhook and store the foot rest attachment and you have a regular chair in seconds. Because lounging outdoors also requires refreshments, the folks at Sunrise have you covered there too, with a matching folding side table. Perfect. When I got in touch with the company, located in Destin, Florida, they were happy to work with me to figure out shipping to Canada. This is no small matter! On top of the usual headaches involving import, I was all of a sudden dealing with a very tight turnaround time because the chairs needed to be made, shipped and received in time for the magazine photo shoot, which occurred right about this time last year. At the time I was still on staff at House & Home. When the shipment arrived at the office I may or may not have squealed with delight. And I may or may not have been overcome by unboxing euphoria as I set up this chair outside my office. I could tell immediately how well made they are. The wood frames are white oak and fittings and hardware are all rust-proof brass. I ordered a dark charcoal grey because the colour was perfect for the wooded camp setting. Isn't it interesting how different the chair looks in this colour as opposed to all those bright beachy colours? Such chameleon this thing! Here's my Instagram from shoot day with the sun loungers in position on my client's peaceful secluded back dock. Heaven! Here's another screen grab from the video showing the front deck. In summary, I cannot recommend these chairs enough. They are beautifully made, Sunrise offers customization options like embroidery and custom fabrics. Customer service is speedy and friendly and the price is absolutely right. A chair without footrest is $149US, chair with footrest, $195US. If you order from Canada, don't forget your total will jump with the exchange rate, shipping and duty.